These potatoes are perfect with roasted chicken or turkey breast - pesto and bacon are the best pair ever! When I was really young (like middle school), I used to make potatoes in the oven a ton. By the time I hit my teenage years, I loved to cube up potatoes and cook them up in a skillet. Once I met my husband, we would cook up either fried potatoes or roasted potatoes constantly. They are total comfort food and they go with everything that isn't pasta or rice-based. I was excited to make these potatoes because not only do they have bacon and cheese, but PESTO too. Oh, how I love pesto. Pesto makes everything better. And with bacon, these potatoes are just incredible. And just like that...winter is upon us. I'm craving all the comfort foods which is reflected in this week's meal plan for sure. Making some old favorites and some soon-to-be new favorites! I'm still debating whether we will have frozen pizza or just frozen junk food on Friday because Matthew isn't eating dinner with us that night. The year is winding down and it's time to announce the Countdown to 2018! It will be my fourth year hosting and it is still one of my favorite blog events to do each year. If you have a food blog, you definitely want to keep reading! From December 26 until January 1, food bloggers will share their best recipes posted in 2017 to ring in the new year. Each day has a different category but bloggers are not required to join in for all the days, if they don't want to. Each day a blog hop will open at 12:00am EST and close 48 hours later. The first day of January is the Wild Card category, which means you get to choose what category you want to share. It can be YOUR favorite recipes posted in 2017, underrated gems from 2017, recipes you want to try in 2018, best beverages of 2017, etc. It's totally up to you! If you have any questions, please email me at fantasticalsharing1 at gmail dot com. 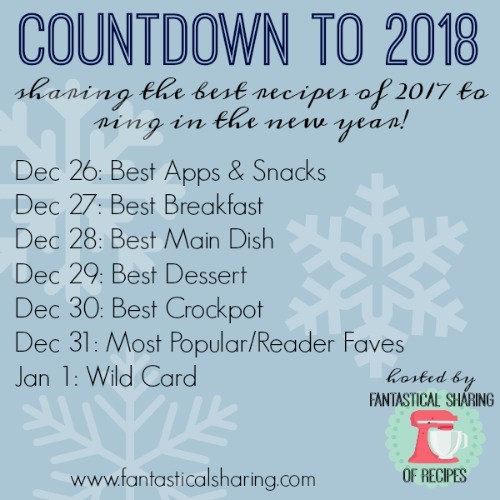 I'll see you back on the 26th for the first Countdown to 2018 post all about the best appetizers and snacks recipes of 2017! Sign up for the mailing list is below the image at the end of the post. This casserole has chicken and marinara and topped with Red Lobster biscuits - so delicious! I have yet to have an authentic Red Lobster Cheddar Bay biscuit because I'm honestly not a huge fan of seafood, so I don't really ever go to Red Lobster. I have always meant to make homemade copycat biscuits, but never got around to it. I actually wasn't even aware there was Cheddar Bay biscuit mix, but took a chance that I would go to the grocery store and it would be there. I was really happy with how this turned out. I love anything with marinara and the biscuit topping was seriously amazing. I have got to make homemade Cheddar Bay biscuits soon. This tasty fried chicken copycat is easy to make at home and finger-lickin' good! I haven't had KFC in ages but my family used to get it a ton when I was a kid, so this copycat recipe definitely brings up good memories. We paired our chicken with mashed potatoes and corn - I totally forgot biscuits - shame on me, right?! Regardless, this meal definitely filled us up and I know that Nick and the kids cannot wait to have it again. We love spicy fried chicken, but this seasoned crispy fried chicken was great too! Matthew requested Tuesday and Wednesday's meals, but I think he will be really excited for ramen on Thursday. He is obsessed with anime and loves when we have ramen. There are a few recipes that are old favorites to remake and get a better picture of those foods! 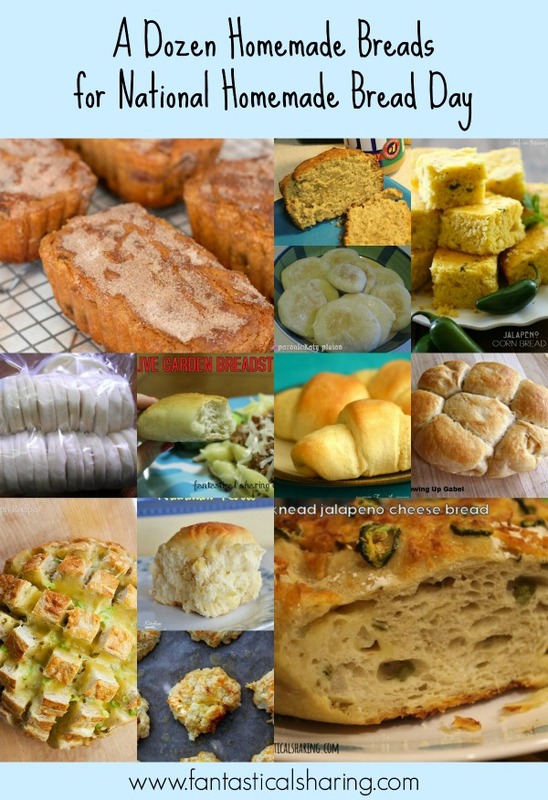 November 17th is Homemade Bread Day and that means I have recipes to share, of course! Homemade bread is one of my favorite things in the world. I love so much the aroma that wafts through the house when it's in the oven. This soup is the ultimate creamy, stick-to-your-ribs meal with all the goodness of alfredo in it! I honestly didn't think I could like a soup so much and then I had this one that brings alfredo pasta to soup form. I just loved how wonderfully creamy and thick this soup was. It really sits nice and heavy in your stomach and is perfect for a cold night. Tennessee has been quite the whiplash for weather lately. It'll be really cold but then semi-warm the next moment. So I am not sure if I'm ready just yet to have this soup again, but I know we aren't too far off from it. We decided to do a lot of oldies in November. 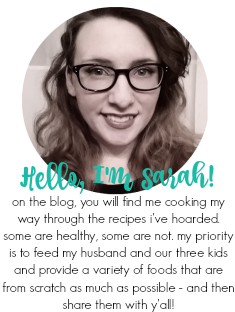 I am really happy about it because I have been going through my old posts and making them SEO-friendly and taking out broken links to linky parties and updating pictures as I go. I really need to update a great deal of the ones from when I first started my blog in 2010. Also...SUNDAY BREAKFAST!! The shredded brussels in this recipe take on a much milder flavor and they are perfect in this creamy pasta! I'm working on convincing my family that brussels sprouts are delicious. I love them and would eat them any which way. I figured that if they were shredded, Nick and the kids might take to them a little better. Plus I figured that carbonara would definitely win over their hearts...er, stomachs. I was glad to be right! Nick and the big kids did love this recipe. They actually didn't realize that it was brussels and were all pleasantly surprised and I think more willing to try brussels in the future because of this recipe. I think the shredded brussels pick up more flavor from other elements in the recipe and become a little less bitter. I personally don't mind their bitterness, but I think that was definitely one of the reasons this worked so well for the whole family.